NTC Jobs 2019 National Telecommunication Corporation Islamabad NTS Application Form Latest "
National Telecommunication Corporation (NTC) , The official Teleco service provider to the Government of Pakistan has announced various vacancies. Announced NTS jobs are Assistant Divisonal Engineer (ADE), Assistant Director AD (HR), System Administrator, Database Administrator, Security Administrator, Email Administrator, Data Network Technician for NOC Services, Building Overseer, Junior Technician & JDNT. 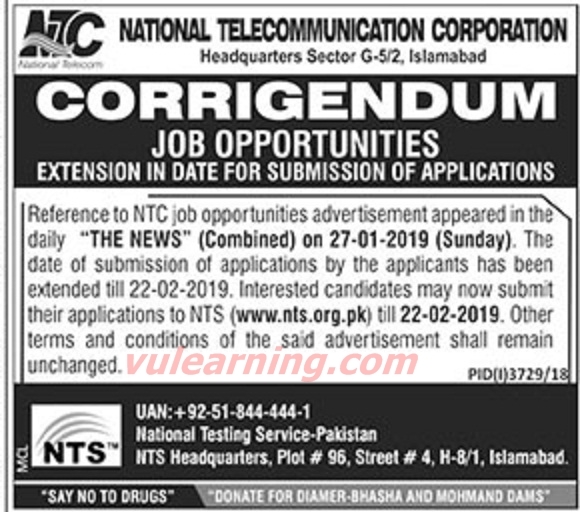 The Latest Adverttisement of NTC Jobs 2019 National Telecommunication Corporation Islamabad Published in Daily The News Newspaper on 27th of January 2019. Age limit should be 25 to 35 years is required. How to Apply for NTC Jobs? Duly filled application with paid deposit slip should be paid in favor of NTS and should be submitted to the Address: NTS Headquarters G-5/2, Islamabad. ​No TA/DA will be admissible to the applicants for Test / Interview. Corporation reserves the right to increase / decrease the number of vacancies or not to fit any vacancy. Only PEC Registered Engineers can apply for the posts mentioned at Sr.No.1.3.4.5.6. (where applicable).